Aren't these the most adorable little squirrels? 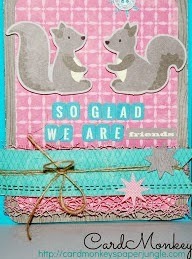 This little card -- "So Glad We Are Friends" -- incorporates a textured pink mesh under the blue banner to give it a little more interest on the Jillibean Soup CardKitchen kit card. Isn't it a sweet card, with those adorable squirrels? ...and Happy Labor Day, especially to all those union members and trades workers whose excellence in their crafts built America to what it is today. Thank you to family members especially, including hubby John (Plumbers' Local 690), and my favorite Aunt Joan (Teachers' Union) and my late grandpa Bert (Printers' Union). Happy Labor Day!!! I love this card and the Mama's Mesh looks AMAZING on this!!! You always do such a marvelous job!!! Hello, Ellen - we're so treasured to have you back with the LBC CT for another term; your darling card is full of color and texture which give a uniqueness to this project; love the squirrels!! love the texture on the bottom with the mama's mesh! What a pretty card! I love how you added the mesh!